The tenor tells ROH supporters about his role. 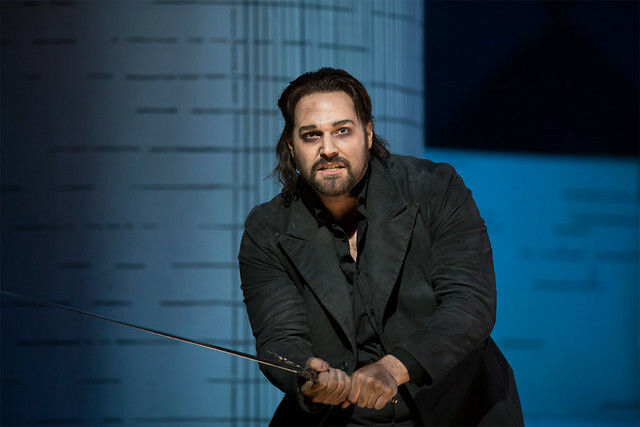 Tenor Bryan Hymel - and his role in Robert le diable - was the focus of a recent event for The Connoisseurs’ Series, one of the Royal Opera House's circles of support. 'It’s great to be in this production with such a great cast. There are also some challenging arias which will really impress the audiences. 'My score includes some very difficult sections with lots of C#s and Ds. It’s a tenor part but it’s over two octaves, which isn’t that common; the soprano parts are the same. 'It was a proud moment when I first came in to sing through the music with Tony Pappano and afterwards he said to me: "If you can’t do this, nobody can." The reality is that it’s been three years since I was first approached to sing the role of Robert, so I’ve had some time to prepare. Find out more about Connoisseurs' Series events, including those with Written on Skin composer George Benjamin and author Martin Crimp and Raven Girl collaborators Wayne McGregor and author Audrey Niffenegger. Robert le diable runs from 6 - 21 December. Tickets are still available. I thought Bryan Hymel was the best and most refined Robert I have heard in the role. The technical requirements were all met and the elaborate vocal decorations, which beat even Rockwell Blake and certainly Alain Vanzo, were beautifully articulated. Strong acting with real conviction and totally believable as the son of the Le Diable and a good woman! - all round a five star performance for me! Thank You. I thought, at least from what I heard, that this was a superb performance. Mr. Hymel is indeed a rare thing! I only hope we will see it at The Met. The only thing I am sorry about is that the score was cut, not drastically by any means; the Ballet in act 2, and parts of the Robert Bertram duet. Completely understandable when the role of Robert is SO crazy difficult! But thank you for bringing this to us!!!! We are forever grateful. Perhaps this will set off an interest in reviving Meyerbeer now that we have a tenor who can cope with these roles.